In the summer of 1976, three teenage girls and best friends dub themselves "beach girls," and vow that they'll always be close to one another. Years later in present day, one of the beach girls - Emma Kilvert - has passed away, and the remaining two beach girls - Stevie Moore and Maddie Kilvert - rarely speak to one another. When Emma's husband and daughter return to Hubbard's Point, Connecticut for the summer, they instantly connect with the bohemian, free-spirited artist Stevie Moore. While bonding with Jack and Nell over the loss of Emma, Stevie can't help but find herself hopelessly attracted to Jack - and the feeling is mutual. Meanwhile, Jack's younger sister Maddie is still struggling with the death of her sister-in-law, especially since she feels partly responsible for Emma's death. As this group of friends and family members reconnect at their beloved summer getaway of Hubbard's Point, they forge renewed relationships with one another and eventually find forgiveness. Beach Girls is finely executed - a beautiful, sweet, and sad story. Although you can probably already guess what happens in the end, the journey itself is romantic and leisurely. What's not so obvious in Beach Girls is the mystery surrounding Emma's death - the details of which are not revealed until the very end of the novel. I don't have any one specific favorite part in Beach Girls (I loved it all), but my favorite supporting characters are Stevie's aunt and cousin who live in an ancient nearby castle. I felt that her aunt and cousin add extra color and pizzazz to a story that's already quite vibrant. Also, despite seeking this novel for the romance factor, my favorite aspect of the novel is actually the development of the budding and trusting relationship between Stevie and Nell, which is absolutely adorable and endearing. If I had to choose one word to describe how I felt while reading Beach Girls, it would be "wholesome." The novel is just an all-around great read, and I think Luanne Rice is the perfect go-to author when you need a happy read or maybe just a pick-me-up. I usually find myself picking up contemporary romance novels after reading horror novels, or novels that are super intense and dark. That said, I'm glad I took the time to try Luanne Rice because I was completely satisfied with her work! 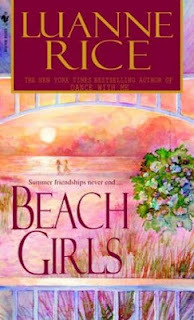 If you use bibliography resources like Fantastic Fiction, you'll notice that Beach Girls is listed as part of the Hubbard's Point/Black Hall series; however, don't let that point deter you from reading this one out of order. Beach Girls definitely qualifies as a stand-alone novel, so reading the series' predecessors isn't particularly necessary in this case. Also, Beach Girls is so great that it inspired a Lifetime television miniseries featuring Rob Lowe and Julia Ormond, so if my review alone doesn't convince you that this novel is amazing, maybe that will. Luanne Rice's newest releases are The Lemon Orchard, Little Night, The Silver Boat, and Light of the Moon. Have you ever read any books by Luanne Rice, and if so, what did you think? Which of her novels are your favorites? Share your thoughts with us in the comments section below.